As a relatively new technology, solar power offers a variety of benefits when it comes to powering your home. It also is a much better renewable resource to tap into for energy to keep the environment healthy, which also affects the people who live in the environment: your family and friends. With this in mind, you may be considering a home automation system. You’ll want to power it with solar. What can solar energy power in smart home technology? 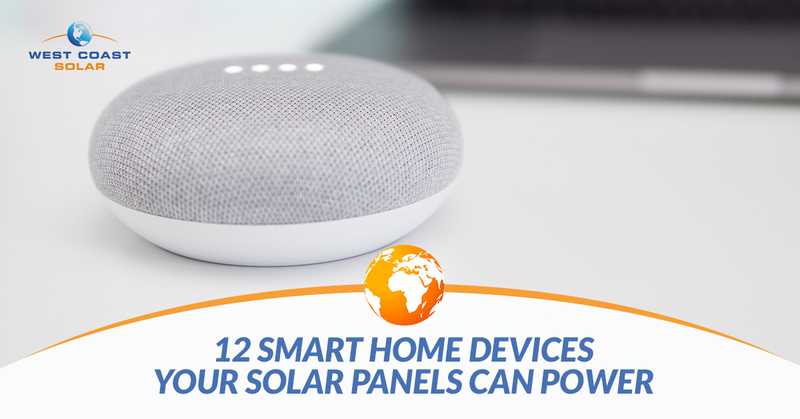 West Coast Solar has created a list of the most popular smart home technology that solar can power. Read on to learn more! Smart Hub: This is the headquarters of your smart home. It collects and shares data so you know exactly how your smart home is performing. It also is the point of contact for all allowed devices to tap into the home’s data, live monitoring, and scheduling. Smart Speaker: These are wonderful additions to a hub. A speaker is a device you can talk to, request it to do things for you online, or even tell it to change the temperature in your home. It’s like a digital butler for your smart home. Smart Lights: Lightbulbs have already advanced to reduce energy usage even when in use. But when it comes to smart lighting, you can monitor and optimize even further to ensure you’re using energy only when you need it and not in excess. Smart Switches: Dim your lights from anywhere. Control power usage from wherever. You can access any smart light via a smart switch from an app on your phone or tablet. Smart Thermostat: One of the more popular first installations in a smart home, the smart thermostat allows you to minimize energy use while still keeping your home’s temperature perfect. Smart Outlet: An upgrade anyone with devices that need to charge or lamps that are used frequently can benefit from. The outlet reduces energy consumption and some models offer voice activation so you no longer have to “switch” something on. You can simply turn it on with your voice. Smart Sensors and Monitoring: A vital piece of any smart home security system is monitoring sensors. Alerts will notify you in real time and the data from those alerts are logged. In some cases, if the alert is severe enough, it will automatically alert local authorities. Smart Lock: A device that automatically locks your doors and windows. It can be accessed and used remotely, which means you can secure or give access to your house from anywhere. Smart Cams: The video on your cameras are directly correlated with being able to see what’s happening on your front porch, in your kitchen, or in the backyard. A smart cam includes sensors and notifications when it picks up motion or a disturbance. Accessible on an app, a smart cam is an added benefit to keeping your family and home safe. Smart Doorbell: A smart device which records those who press or activate the doorbell at your home. This device allows for you or your family to see who’s at the door before ever looking out the window or opening the door. Smart Smoke Detector: A wonderful fire protection addition to any home. The device sends real time alerts and in some cases will notify local authorities if the situation is serious enough. Smart Vacuum: A neat device that will vacuum your home without you needing to push it around. These are only a handful of smart home technology devices you can add to your home. Remember that these devices need a reliable energy source to function properly. West Coast Solar has been providing solar panel energy to Northern California for over a decade. Why not make the switch and do your part in using clean, renewable energy. Keep your family safe with a smart security system. Keep you home climate as you like with a smart thermostat. Power it all with West Coast Solar! Shop online today!